DoCE (Dosing for Controlled Exposure): Dosing strategies for characterising in vitro dose-responses with increased relevance for in vivo extrapolation. Sponsored by Unilever and Shell, this challenge aims to develop methods and tools that will better quantify and control the exposure of chemicals for predicting in vivo toxicity. A better understanding of the in vitro concentrations used and how they may relate to in vivo exposure will increase the success of using in vitro approaches early in development to de-risk candidate molecules and hence avoid unnecessary animal testing. If successful long term, the challenge will provide essential tools in the evaluation of safety in the pharmaceutical, chemical, petroleum and consumer product sectors without the use of animals. The CRACK IT challenge competition brings together large industries, academia and SMEs to develop marketable products or improve business processes that will have a significant impact on the use of animals in research. The CRACK IT Challenge is the NC3Rs’ response to the changing environment in the biosciences. The NC3Rs is a UK-based scientific organization dedicated to replacing, refining and reducing the use of animals in research and testing. Animal-free mechanism-based toxicity testing – predict toxicity after repeated dose inhalation exposure by using a read across approach (1.1.2017 – 31.12.2019). The collaboration between the University of Göttingen, geneXplain GmbH, PharmaInformatic and the Fraunhofer Institute for Toxicology and Experimental Medicine (Fraunhofer ITEM) aims to develop an integrated approach for testing and assessment (IATA) to replace animal studies with repeated inhalational exposure. PharmaInformatic uses it‘s platform technology to develop predictive models, which evaluate pharmacokinetic and toxicological properties of substances, for example plasma protein binding. Drugs and toxic substances can be bound to proteins in plasma or blood, which reduces the free (effective) concentration of compounds in vivo. For toxicity evaluations it is very important to know to which extend a compound is bound to these plasma proteins. The created models show a high quality of prediction: Based on a large validation dataset. a low mean absolute error and a high correlation between experimental and predicted PPB values was observed (prediction of protein binding in human plasma). A collaborative project funded by the German Federal Ministry of Education and Research (BMBF) in the funding program “e:ToP – Innovative Toxikologie zur Reduzierung von Tierversuchen”. Avivia BV and PharmaInformatic have entered into a research collaboration agreement. Under the terms of the agreement, PharmaInformatic has estimated human oral bioavailability of prodrugs for the treatment of cancer. We used the Impact-F system to assess the oral bioavailability of two different prodrugs of the same drug that we had in development. We did not have the resources to investigate the oral bioavailability of both with the traditional approach in animals (labelling the mand full pharmacokinetics). The Impact-F analyzed our molecules and it found out that chemically speaking it was very comparable to some other prodrugs and drugs from which oral bioavailability data was available and we used this to make a selection. This lead candidate is now in clinical development. In conclusion, we were quite impressed with the Impact-F system and it really helped us to better understand our prodrugs without too many animal experiments. PharmaInformatic and UNIZYME Laboratories A/S have entered into a research collaboration for the development of new therapeutic agents for the treatment of inflammatory diseases. The research collaboration is initiated and supported by the European Union IN2LifeSciences project and by the Interreg IVB North-West Europe programme. PharmaInformatic uses the expert system IMPACT-F to prioritise dipeptidyl peptidase I inhibitors (DPPI, cathepsin C) based on their estimated oral bioavailability in humans. Dipeptidyl peptidase I is a therapeutic drug target for the treatment of a number of inflammatory and autoimmune diseases. Cathepsin C inhibitors could potentially be effective therapeutics for the treatment of asthma, chronic obstructive pulmonary disease (COPD), cystic fibrosis, sepsis, rheumatoid arthritis, psoriasis, myocardial infarction, inflammatory bowel disease and multiple sclerosis. PharmaInformatic and BRIDGE BIORESEARCH PLC have signed a collaboration agreement. Under this agreement PharmaInformatic applies the expert system IMPACT-F in order to predict the oral bioavailability of drug candidates for the treatment of type 2 diabetes. "We are developing a molecule for the treatment of Type II diabetes and had all documentation ready except for data on the bioavailability in humans. We were approached by the German biotech company Pharmainformatic which has an expert system called IMPACT-F that predicts the oral bioavailability of novel drugs in humans. We agreed with Pharmainformatic to apply for an innovation voucher to finance the test of our drug and in short time our development project was taken to the next step." Diabetes mellitus type 2 is a metabolic disorder which affects a large number of people. According to the World Health Organisation, about 347 million people suffer from diabetes worldwide. About 90% of them suffer from diabetes type 2. Oral bioavailability is a key property in drug design and development. The expert system IMPACT-F estimates oral bioavailability of future drug candidates in humans. 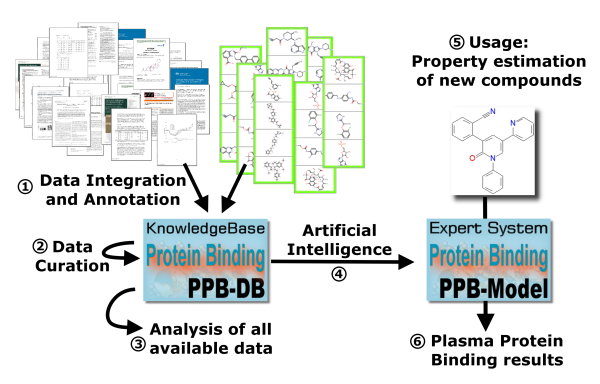 The calculation is based on reliable computational models, which have been derived from the largest knowledge base on bioavailability worldwide (PACT-F). Several research collaborations are supported by the European Union IN2LifeSciences project and by the Interreg IVB North-West Europe programme. IN2LifeSciences supports SME with the development or commercialisation of their innovations. PharmaInformatic is a technology provider within the IN2LifeScience program. Is IMPACT-F restricted to a specific therapeutic area, such as antibacterials or cancer? What is required to predict oral bioavailability with IMPACT-F? Looking for similar drug structures and bioavailability data related to your research project? Bioavailability data from similar compounds to a specific drug-candidate are very difficult to find in the literature. Without using a structure based knowledge base it is almost impossible. PACT-F can help to identify the most similar drugs which have been previously investigated in preclinical and clinical trials. Contact us for more information.